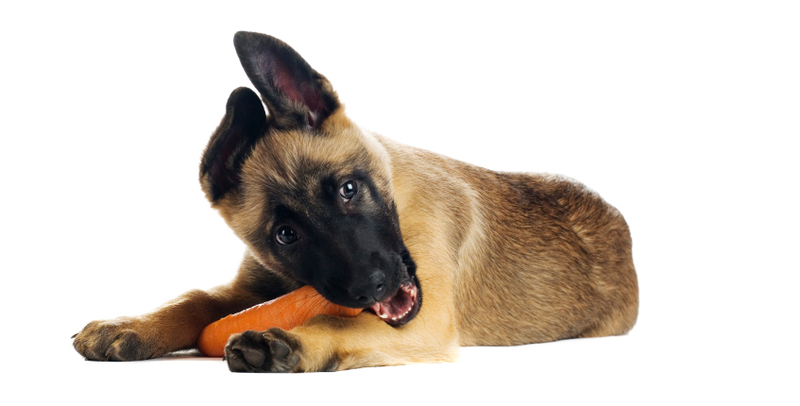 Many dog owners still wonder and ask “Are Carrots good for Dogs”? They most definitely are! Granted, dogs need animal proteins and fats, but a small amount of a nutrient-rich vegetable can greatly benefit a dog’s health. Especially a root vegetable like the carrot because they are nourishing and healing. You can make a difference in your dog’s life and save money as well by simply adding a daily dose of carrots to your dog’s meals. This will add whole food nutrition, which is what is lacking in commercial pet food, and will promote obvious, visible changes in physical and emotional well-being. By making this one simply change in your dog’s diet, you can save on vet bills because the additional natural nutrition will improve your dog’s overall health and can help relieve many ailments that are commonly seen in dogs these days. Because root vegetables grown underground, they are rich in vitamins, minerals, and other vital nutrients, some of which are highlighted below. In addition, carrots are a great source of dietary fiber, and they contain many health-protective phytonutrients that are only found in plant material. Carrots are loaded with beta-carotene which converts to vitamin A upon ingestion. Vitamin A helps promote optimal growth, healthy skin, eyes, teeth, gums, lungs, mucus membrane, and top-to-bottom digestive tract. Vitamin A is inner and outer armor, protecting against infections. Carrots contains B family vitamins (B1, B2, B3, B6, biotin and folate), each provide their own unique benefits. B complex vitamins are vital to health of the nervous system, and they are important for the proper metabolism of proteins, fats, and carbohydrates. This vitamin is a great antioxidant to help protect against disease, it is a great detoxifier, helps build collagen for the connective tissue, and it is important for the defense mechanism because it destroys germs to fight viruses and bacterial infections. This vitamin has a long list of benefits. Just to name a few, it boosts the efficiency of the heart and circulatory system, improves the immune system, improves muscle power and stamina in dogs, protects against the damaging effects of air pollution, helps heal skin problems, and helps rejuvenate old dogs. Vitamin E also makes other vitamins and minerals work more efficiently. These two minerals are needed for the formation of bones and teeth, and are therefore important to growing puppies. Calcium and phosphorus are essential for a normal nervous system. Calcium plays a role in proper blood clotting, and phosphorous is involved in the metabolism of carbohydrates. Helps the body absorb calcium, vitamins C, E, and B complex. Magnesium is also important to the health of the nervous system. This mineral is necessary for normal reproduction, bone and cartilage growth, collagen formation, and fat metabolism. Manganese is also involved in the activation of various enzymes related to the proper utilization of vitamins B1 and E.
Carrots have an impressive lineup of nutrients and have been credited with many medicinal properties. They are especially cleaning, soothing, and healing to the intestinal tract. 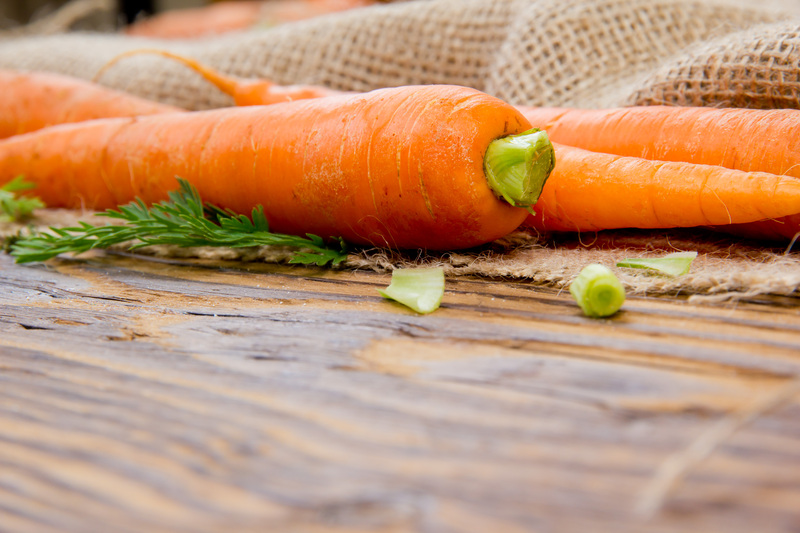 Not only do they relieve and prevent diarrhea as well as constipation, carrots promote overall gut health which is extremely important because the health of the gut affects your dog’s entire body. More and more dogs are suffering from a condition called leaky gut, which is hard to diagnose, and can cause problems like allergies, joint pain, autoimmune diseases, and even cancer. You might not think that these conditions are related to digestive problems, but many unrelated ailments and disease can actually be cause by gut problems. Carrots also help heal many skin ailments because the are one of the richest sources of beta-carotene, which converts to vitamin A upon ingestion, and vitamin A is essential for healthy skin.